Hey Ashley Noelle: Guess What, Reese? You Are Going To Be A Big Sister! Guess What, Reese? You Are Going To Be A Big Sister! Reese, it's time for one of our talks again.I've got some really big news to tell you. Life changing news, really. Something really small is about to change all of our lives forever and we are so excited. My story starts with this tiny little stick. Wait, wait, wait, Reese. You don't want to grab that. I know, its gross. I'm sorry. But, I think you need to know what this means. You know how mommy and daddy have been praying for a tiny little addition to our family? Yes, praying just like that. Yepp, it's what you're thinking. 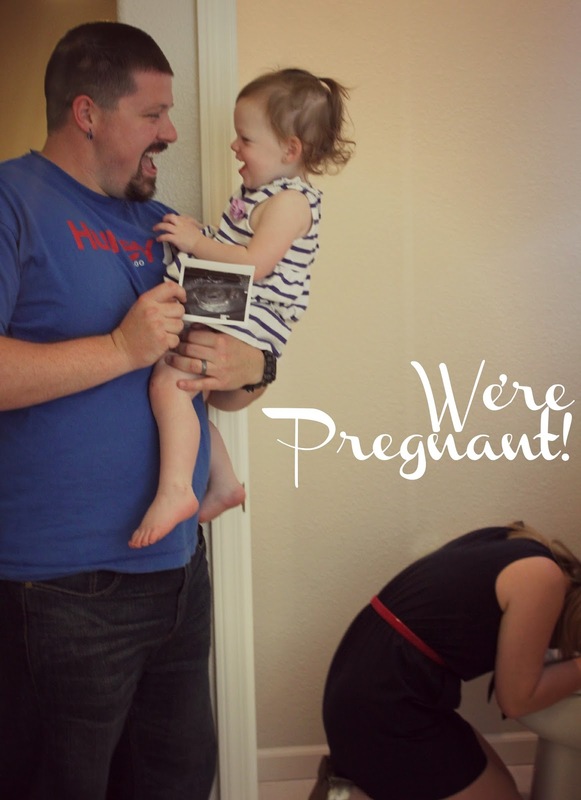 We are having another baby!! That means you are going to be a big sister!! I am so glad to see you are so excited about it! I knew you would be. You are so friendly and active and I know you want someone to play with. Well you're little playmate is going to be coming sometime around April 26, 2013. I want you to know, that you are always going to be so special to us. Mommy & Daddy love you for so many reasons. And you're special in a new way now... you're going to be a big sister!! I am a big sister and I love my little brother and little sister more than they will ever know. They have been my best friends throughout my life and we've shared both really fun and really hard times together. I know you are going to love having siblings You've already been comforting me when I wasn't feeling well, so I know you will love being a big sister, too! Remember two weeks ago when mommy was taking those pictures of her stomach and you thought it was so weird? Well, mommy is going to do something crazy brave and post them on the internet every month so we can watch your little sibling grow and tell it about what's happening at this very early stage of it's life. This is just precious!!! I pray your all day sickness goes away quickly!!! Enjoy your pregnancy. hmm....5Ohpeanut? SO INCREDIBLY HAPPY FOR ALL OF YOU! And you couldn't have written that post more perfectly. Those photos and the commentary? PLEASE. Too perfect! I thought I was going to sound all original and say 5ohPeanut, but katie_shannon up there already said it! :-/ Well, at least you know I'm not a nut for suggesting it. I am so happy for yall!! Congrats!! 5oh Nugget is blessed to be part of your clan! Praying with you guys... Big hugs from all of us!!! Very exciting & sending lots of prayers for you & the fam! 5Oh Nugget is blessed to join the 5Oh clan! So excited and praying with you! Big hugs from our FAM to yours! I love those photos of you and your daughter. So so sweet. So excited for your family!! YAY for YOU!!!!!!! So exciting. I know it's tough not feeling well and having to take care of your little one....so hang in there! I hope this will be a wonderful pregnancy. I love that you are keeping the pics of your growing bump! Congrats and hugs to you! So exciting! I can't wait to watch your journey! congratulations!! i love that you are just looking at the camera and 5ohbaby is making those great expressions. I'm so excited! These pictures are adorable, what a fun way to capture your expanding family. Congrats Ashley and 5ohFamily! So fun! Oh friend, so happy for you :) This post could not have been written more perfectly - so moving and sweet. Love you! Congratulations!! (Again!) I am sooo excited for you! and I love this post and the way you wrote it! Amazing! What a beautiful post! I love, love, love how you announced this! SO EXCITED FOR YOU! CONGRATULATIONS! Cutest reveal ever. What about 5ohlittle as in little sister or brother? Congrats! The photos are absolutely adorable! Yayyyyy! Your due date is exactly a month after mine! Mine is March 26th 2013! How fun to see you go through this journey online through your blog. congrats! YEAH!!!!! I'm so excited for you love! April babies are the best, but I'm about to say that about December babies too ;) Hope the beginning isn't too rough on you. CONGRATS LOVE! I suggest and vote for 5OhSibling. Oh honey, congrats to your sweet family! Aw, Congratulations!!! The pictures are just too stinkin' cute! Sooo excited for you! This is such a wonderful blessing!! Congratulations, 5ohfamily! :D I'm so excited for you... Can't wait to watch the 5ohBump grow and meet this little one next year! Best pictures ever. So fuN! Congrats agaiN! What exciting news that is :) Congratulations! Congrats! && Your pictures with 5ohbaby were so perfect for the story!! Ahhhhhhhh so excited for you Ashley! You are such a beautiful momma and momma to be :) Can't wait for this little one! Congratulations! I love the way you did your post story. I knew it! I thought this yesterday when I came to visit your blog....I just had the thought. Crazy! Congrats! P.s I am pregnant, again, too! You can watch my weekly progress on my blog. CONGRATS!! I love this little story. It's too cute!! Love your baby girl's expressions, lol. YAY!! CONGRATULATIONS :) 5ohkiddo maybe? Congratulations! I'm so happy for you! And what an adorable way to announce it! Did you take specific photos with the blog post in mid, or just go with photos you already got? awww congrats!! So happy for you, and these photos are the most adorable thing ever! 5ohBump, would be cute too because you'll be a bump for the whole pregnancy! :) CONGRATS! I'm overly thrilled for you! you are one of my favorite blogs!!! Congratulations, The story line of photos is so cute. I might even sew something cute and send it your way. Congrats Ashley!!!! How exciting for your family!!! I'm so happy for you! OHEMGEE! Congrats!! This is sooo exciting! I saw a tweet about morning sickness and knew EXACTLY what I was going to find here! I love the pictures and 5ohbaby's reactions ;) If it's a boy, it could be "5ohBoy", and if it's a girl it could be "5ohBabySis". I'm sure everyone has come up with amazing suggestions! Congrats!!! So happy for your little family! Congratulations! I'm super excited for your family. Big transitions, yes, but totally worth it. Congratulations! What an exciting time for y'all! Cutest blog post! And I just love 5ohbaby with all of her expressions! She's so animated! congrats. i'm due with baby #1 in feburary, so it'll be fun to follow along with your updates! hope you're feeling well! CONGRATS! we just had our 2nd baby :) I can't believe though i've been reading ur blog since before ur first baby! i actually remember the first blog i read from you haha, anyway congrats :) my hubby is starting paramedic academy next month so i started a similar blog about our journey so i'm glad i get to read yours as i guess my life by this time next year will be very similar! Congratulations, Ashley! I'm so excited for you! 5ohBaby's expressions are hilarious! Oh my, that was the cutest thing ever! Congratulations!! I'm super excited for you. this is the CUTEST post ever, in the world, ever written! so many congrats to you and your family!! I am due one day before you! So exciting! Naww how exciting! I love love love this because my little sister is also pregnant and is due right around the time that you are! It's my very first niece or nephew so I can learn more about it all through your blog! I'm glad I got to "meet you" through the Girl Behind the Blog link up party.